Peter Krauth writes: The U.S. dollar has been the world's de facto reserve currency for almost 90 years. Along with reserve currency status come the roles of financing international trade and acting as a store of value for governments worldwide. When we look back over the past 500 to 600 years of reserve currencies, an interesting pattern emerges. 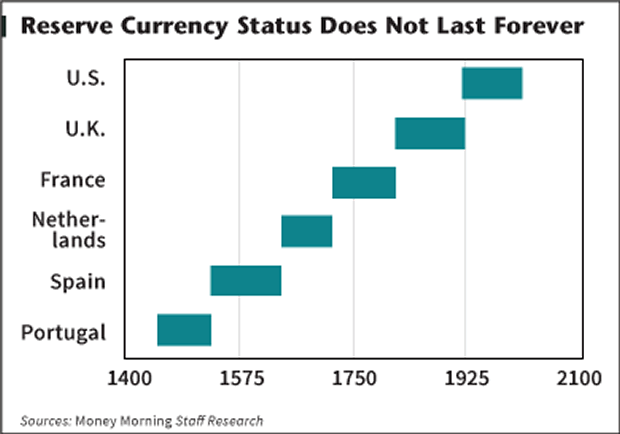 As this chart shows, since the mid-1400s, there have been six different reserve currencies. Tied for the shortest lifespan are Portugal and the Netherlands at 75 years, while the longest tenures are Spain and the UK, both at 110 years. The average has been about 95 years... and the U.S. dollar has presided for the past 88 years. As you can see, reserve currencies come and go. It's not a question of if, but when. And it appears the greenback's dominance has reached its twilight. Until 1971, when Nixon closed the "gold window," overseas dollars were backed by gold. That meant foreign governments could redeem their American dollars for gold at $35 per ounce. But the 1950s and 1960s saw ballooning deficits, inflation, and swelling debt from welfare and warfare as America's share of the world economy shrank. So Kissinger and Nixon hatched the petrodollar system, whereby the United States would provide political and security support to Saudi Arabia's royal family. In exchange, all oil deals would have to be transacted exclusively in dollars, and the House of Saud would buy lots of Treasurys with their greenbacks. In effect, this guaranteed a constant and elevated (though artificial) demand for U.S. dollars worldwide. But still, using the unbacked dollar as a world reserve currency is a massive experiment in fiat money. It's never been tried before... and it's unlikely to end well. In the past few years China established a string of currency swaps with other nations to settle trade, bypassing the dollar completely. The goal is to help internationalize the yuan by gradually growing its level of acceptance. It's working. On Dec. 4, 2013, the Wall Street Journal reported that China's growing slice of the world's economic pie saw the yuan overtake the euro and yen in trade finance. According to the Journal, "That made the yuan the second-most used currency in trade finance but still well behind the U.S. dollar, which backs 81% of trade finance." The yuan now accounts for 8.7%, but it's gaining quickly. In October, China announced a 350 billion yuan ($60 billion) swap for euros with the European Central Bank. That ranks second only to its previously established 360 billion yuan swap line with South Korea. There's even a 400 billion yuan agreement in place with Hong Kong. There are as many as 25 such swap agreements in place with various nations, estimated to be worth nearly $1 trillion. Corporate debt issued in yuan has nearly doubled in the past couple of years to around $50 billion. So clearly, the yuan is being readied for internationalization. China's central bank has stated the yuan would become "basically convertible" by 2015. But what the yuan may look like before trading freely is what's most intriguing. It's no secret that China's been accumulating gold - a lot of gold. Hundreds of tons flow into China each year. Though difficult to track precisely, the country's imports appear to be off the charts. China is the world's largest gold producer, and nearly all its production stays home. Thomson Reuters has indicated that most of the gold liquidated from physically backed ETFs in 2013 flowed east to China. UBS thinks China imported as much as 1,500 tonnes last year alone. That's nearly half of all the gold mined in 2013. Back in 2009 China announced its official gold holdings stood at 1,653 tons, or about 33.9 million ounces. There've been no updates since, but some think we could get news in 2014. I estimate China's central bank stash now stands at 4,409 tons. It could be even bigger than that. Why would China be so hungry for so much gold? Though it may already seem like a distant memory, last fall the United States was in a heated debate over its debt ceiling and the risk of default by mid-October. The federal government was shut down as the world watched. China, as the largest foreign holder of U.S. Treasurys, expressed its concerns and frustrations. Official press agency Xinhua's op-ed writer Liu Chang wrote that the United States' fiscal fiascos warrant "a de-Americanized world." He went on to call for "effective reform," which should include a "new international reserve currency that is to be created to replace the dominant U.S. dollar..."
No doubt, with the yuan expected to be free-floating next year, the Chinese would like their currency to take on a much more significant role. So far their actions are pointing in that direction. Consider China's call for a new international reserve currency, nearly $1 trillion in trade swap deals, and their relentless gold buying. It's not a stretch to figure when China floats its currency, they'll do so with a partial gold backing. Zhang Bingnan, market analyst for China Central Television and vice president of the China Gold Association, had intriguing things to say at a financial conference last year. As a result of his studies on gold's place in the modern economy, he concluded it has an essential role in the current monetary system. Shortly thereafter Tan Ya Ling, president of the China Foreign Exchange Investment Research Institute, spoke at a Beijing gold conference last May. She told delegates that gold is a currency - perhaps even the next world reserve currency - and therefore China has to dominate the world gold market. Suddenly, a gold-backed yuan would carry intrinsic value, something absent from every other currency today. The world would quickly want the yuan, pushing up its value and rapidly spreading its ownership and acceptance. True, a stronger yuan will make Chinese exports more expensive. But China's migrating toward a consumption economy, and a stronger yuan buys them more of the natural resources they desperately need. There's a number of ways to make money on this development. One way is to exchange dollars for yuan. But you don't have to open a Forex account or fill out paperwork at the bank to get access to a golden yuan. There are easier ways. I'm a big believer in the strengthening of gold, and my suggestion is to buy more of it... the bull market is far from over. cial interest in any security recommended to our readers. All of our employees and agents must wait 24 hours after on-line publication, or after the mailing of printed-only publication prior to following an initial recommendation. Any investments recommended by Money Morning should be made only after consulting with your investment advisor and only after reviewing the prospectus or financial statements of the company.